David Bacon is a California writer and documentary photographer. He was a union organizer for two decades. He edited the California AFL-CIO News and the Contra Costa CLC Labor News. His books include Illegal People — How Globalization Creates Migration and Criminalizes Immigrants (2008), The Children of NAFTA (2004) and Communities Without Borders (2006) His new book, coming out later this year, is called The Right to Stay Home, and is about the alternatives to displacing communities in countries like Mexico, and criminalizing the migrants. 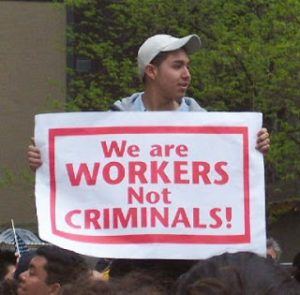 We need an immigration policy based on human, civil, and labor rights, which looks at the reasons why people come to the United States and how we can end the criminalization of their status and work. While proposals from Congress and the administration have started the debate over the need for change in our immigration policy, they are not only too limited and ignore the global nature of migration, but they will actually make the problem of criminalization much worse. We need a better alternative.